"These trail blazers actively demonstrate the importance of diversity and inclusion within the credit union movement. We are proud to recognize their diligent efforts which embody the cooperative pillars that our industry stands upon,” said Renee Sattiewhite, Executive Director of AACUC. 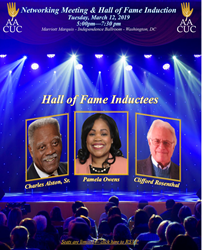 The African-American Credit Union Coalition (AACUC), inducted three credit union leaders into its Hall of Fame during an induction reception at the Credit Union National Association Governmental Affairs Conference (CUNA GAC) in Washington DC Tuesday, March 12. Charles Alston, Sr., Pamela Owens and Clifford Rosenthal were honored today at the special awards ceremony and networking event at the Marriott Marquee in Downtown, Washington DC. Alston has been a volunteer of Aberdeen Proving Ground Federal Credit Union for 30 years and currently serves on its board of directors and as chairman of the credit appeals committee. Owens has over 20 years of experience supporting community development credit unions delivery of products and services to underserved communities, with special attention on innovative product development, training and technical assistance. Rosenthal is the author of Democratizing Finance: Origins of the Community Development Financial Institutions Movement (November 2018). An internationally recognized leader in bringing financial services to low-income and minority communities, he led the National Federation of Community Development Credit Unions (now: Inclusiv) for more 30 years. “These trail blazers actively demonstrate the importance of diversity and inclusion within the credit union movement. We are proud to recognize their diligent efforts which embody the cooperative pillars that our industry stands upon,” said Renee Sattiewhite, Executive Director of AACUC. Virginia Credit Union League President, Richard Pillow announced that the League will donate a $2,000 scholarship in Board Secretary, Lynette W. Smith’s name annually for a credit union employee from a Virginia Credit Union to attend the AACUC Annual Conference. FIS announced that they will be giving a $2,000 Scholarship for 5 years in Maurice Smith’s name because they are so inspired by his contributions to the credit union movement and to be a collaborator for the 8th Cooperative Principle. PSCU will be collaborating with AACUC and sponsoring a webinar series – Women’s Power. On October 16, 2008, the AACUC unveiled an exhibit featuring African Americans in the credit union movement the first 100 years at the America’s Credit Union Museum in Manchester, N.H. Continuing with that effort, the Funding Development Committee created the African American Credit Union Hall of Fame. This virtual hall of fame was created to accomplish two goals: One, to honor and recognize African Americans who have and are contributing to the credit union movement--many who are unsung heroes and trailblazers. To be inducted you must have accomplished or achieved the following: 1) provided in excess of 10 years of service in the credit union industry; 2) worked to provide financial services for people in general; and 3) identify at least four significant accomplishments, which benefited African-Americans’ access to financial capital. The second goal was to be a consistent source of income for the AACUC through sponsorship opportunities on the website. For instance, there are two trailblazer submissions available included with membership with the AACUC at the organizational level. Additional trailblazer submissions are $250. It is a great way to recognize your African American peers, co-workers and colleagues who have made contributions locally. Hall of Fame inductees typically are sponsored by the credit union or a vendor that the inductee worked with for $1500.